Snowdon is my favourite mountain in the UK. I don’t mean the best: that title goes to An Teallach, traversed on a long, sunny autumn day a few years back. But Yr Wyddfa (to give it its proper title) is the one I keep coming back to. It simply ticks so many of the right walking boxes. First of all, it’s a very handsome hill, especially from the east where the ridges of Crib Goch and Y Lliwedd encase the three cascading llyns. (It’s worth climbing Moel Siabod for that view alone.) And its endless variety demands repeated visits: there are eight well-established routes up, plus a few secret tracks to the summit. But as with anything you love, criticism can be felt personally. And Snowdon attracts more than its fair share. For many people, the crowds that descend upon its over-worn slopes are the main problem, especially since the Miners Track was partly tarmacked. But it’s a bit rich to complain about the number of people on a mountain you are climbing. Some walkers dislike the summit café and the railway leading to it; to others, these features are a key part of its industrial history and offer non-walkers the chance to enjoy a mountain. And most would agree that the new café is a great improvement on the old one. But for me the biggest problem with Snowdon is arriving. Traffic jams clog the Llanberis Pass during most of the year, as people drive up and down looking for a parking spot. Nant Gwynant is often little better. And the hundreds of parked cars in the surrounding lanes are an eyesore as you climb above them: even on the wettest day, Pen y Pass is so full it looks like an out-of-town supermarket. The debates around the limited parking spaces in Snowdonia are well documented, but until more people start using the alternative – the excellent Snowdon Sherpa bus network – the pressure on Snowdonia’s environment is unlikely to ease significantly. And with its subsidies being cut, the bus service needs more customers than ever to remain viable. The National Park Authority has made a good start, establishing park and ride schemes and using parking fees to help subsidise the buses. And at £10 to park at Pen y Pass, compared to a £1 fare for the Sherpa from many stops, it makes financial sense too. In time, if a significant number of walkers, climbers and day trippers start using the Snowdon Sherpa to get to its namesake hill and neighbours, there might be funds to run routes more regularly, or to reach more parts of the park. That’s a long-term hope. In the short-term, there’s an immediate pay-off for using the bus. 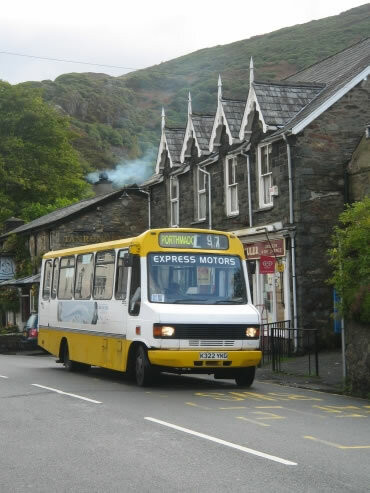 The service is designed to enable people to take one route up Snowdon and come down another. My preferred route? It’s a tough call. Crib Goch is justifiably popular, and while ‘serious’ walkers might sniff at the Pyg and Miners’ tracks, they are a rite of passage for anyone who wants to do Snowdon properly. My tip is to ascend via the Watkin Path. From Nant Gwynant, the route follows the waterfalls into Cwm Llan. As it heads for the top, it switches and twists like a worm trying to find a comfy sleeping position, offering a tricky little scramble up the last few steps. After a tea in the café – go on, join the day-trippers in their high heels and inappropriate coats – there’s a choice for the descent. The Rhyd-Ddu Path drops you at the marvellous Cwellyn Arms, from where you can tackle the Nantlle Ridge the next day. But my favourite is the little-used path (for Snowdon, at least) along the Y Lliwedd ridge, which offers excellent views of showier rival, Crib Goch. The path finishes at Pen y Pass; perfect for catching the Sherpa bus back home. Thanks to Pete Roberts for the photo.